On Whereness and Two days of Aussie GeoRabble! Tonight (Tuesday 8th) our friends at GeoRabble Perth carry the mantle for expanding geohorizons in Australia. There is a renewed energy, spirit and desire for change behind the GeoRabble initiative. With increasing recognition of the importance of Whereness – knowing where everything or everybody is located – as a potential new disruptive technology. GeoRabble is an expression of the Zeitgeist, the changed spirit of the age, as Australia faces new challenges and more people will need help from mapping technology to manage an increasingly uncertain world. Meanwhile, tomorrow (Wednesday 9th) is GeoRabble Melbourne and the organizers send an incredibly gigantic thank you to the speakers who are donating their time, excellent ideas and energy! We’re really proud to have you on board! We thoroughly look forward to experiencing your presentations in such a unique environment that we hope will be free of industry pushes and pulls like most other events targeted at our audience. 6.25pm – Crowd settle/MC intro, thanks to sponsors, explanation of schedule, and intro from one of the founding Sydney GeoRabble organisers, Cisco Urbina. 6.30 – Presenter 1: MILOS PELIKAN – A Journey in Perception and Representation; a cook’s tour of how representation influences what we think is possible. 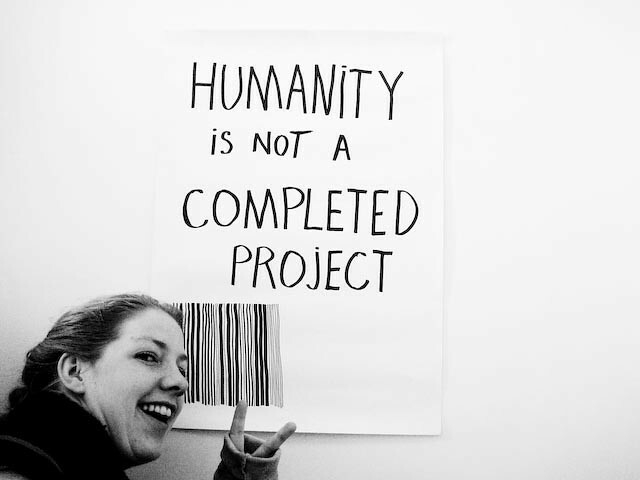 6.40 – Presenter 2: CLAUDIA ABERL – To 3D or not to 3D, That is the Question – What is All the 3D Craze About? 3D modelling – review of the 3D models available – what’s good, what’s bad and what’s reality. Presentation will explore some examples of 3D models (Geelong, Melbourne, Frankston, Ballarat) created using different GIS 3D packages; Where is the line between GIS reality (Accuracy and reliability) and model (facades and texture) become blurred – what’s all the craze about? 7.00 – Presenter 4: Martin VON WYSS – Melbourne Meetup Map Feelup – We all have an uncle in the emergency services who has claimed that “a printed map with a bullet through it will serve a soldier better than an electronic device with a bullet through it”. And we have probably all insisted at one time that interactive web mapping applications are great because they let the user choose the colours that are prettiest.Let’s put tired cliches and absurd arguments aside and begin the healing by conceding that the digital and analogue words can work together nicely. And since we’re all in the same room, let’s look at some cool examples. 7.10 – Presenter 5: ANDREW WISE (or Laura if Andrew is still unwell) – Uh Oh, Where Did the Rest of My Road Go? Blocked roads create recurring problems for emergency services organisations. Valueable time is lost when emergency vehicles enter from the wrong end of an noncontinuous road and have to double back. Andrew does some clever techy network analysis on Vicmap Transport in SQL and finds incredible numbers of these blocked-roads across Victoria. 7.20 – Presenter 6: ROHAN FERNANDO – Google Earth Builder: Under the Hood – Bring your spanners and grease-monkeys, we’re going in! So what’s really under there? 7.30 – Really quick thanks again to sponsors & draw the door prize (iPad) winner before everyone runs out the door. We may throw this in at an earlier time depending on how time goes / the vibe of the night. 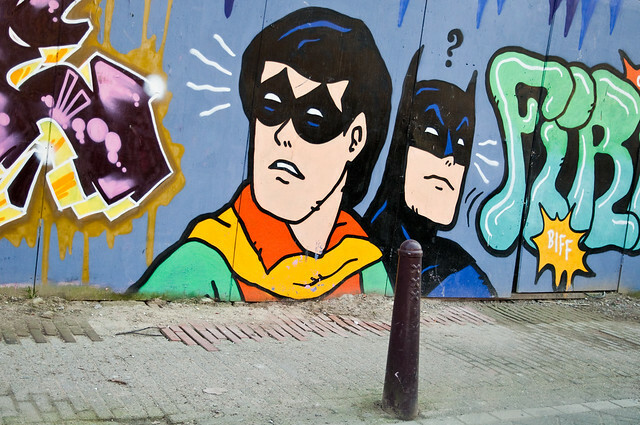 Here’s a Geo-Trivia Question: Where (country & city) was the Batman & Robin Graffiti photo taken?